Aldi's advertising was the most-remembered TV spot for the second month running. 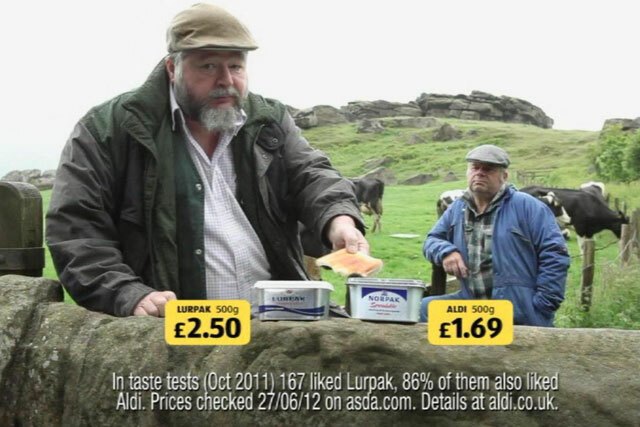 "Spread", by McCann Manchester, features two farmers comparing their butter. The supermarket also came top in the most-liked TV ads category, according to data from Nielsen and NM Incite. Dare's Gocompare.com spot, in which Sue Barker attempts to blow up Gio Compario, was the second most-remembered ad. Gocompare also topped the most-discussed-online category, with close to 4 per cent of all online conversations about advertising focusing on the spot. Apple's "genius" campaign was more talked about, but didn't air in the UK so was removed from the scoring. The "most-remembered" score is the percentage of viewers who can recall within 24 hours the storyline of an ad. These scores are indexed against a mean score for all new ads, with 100 representing this mean. The "most-liked" score is the percentage of viewers who liked a spot indexed against the mean score of 100. Source: Nielsen TV Brand Effect and NM Incite. Only new ads airing 1-31 July 2012. Minimum sample = 150.